Mister Chico on the Saco | Can I Bring the Dog? 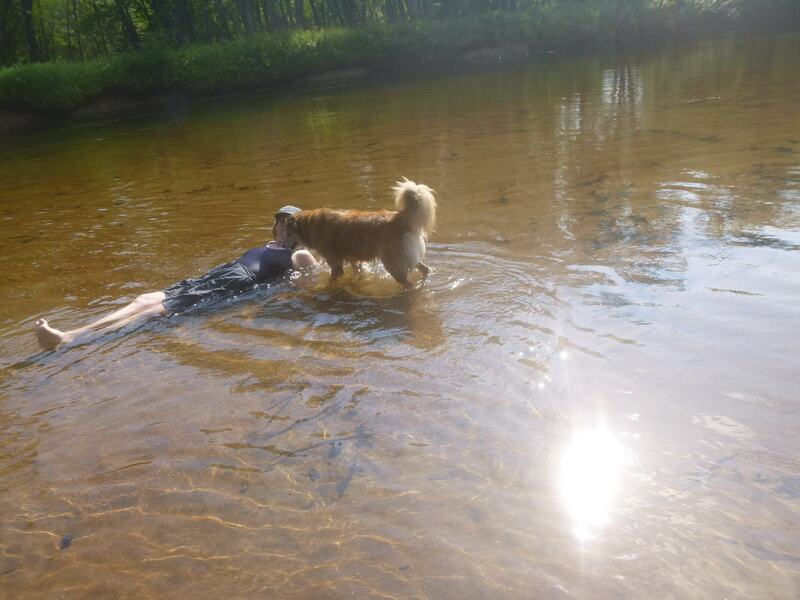 With company in town, it was time for a trip down the Saco River. 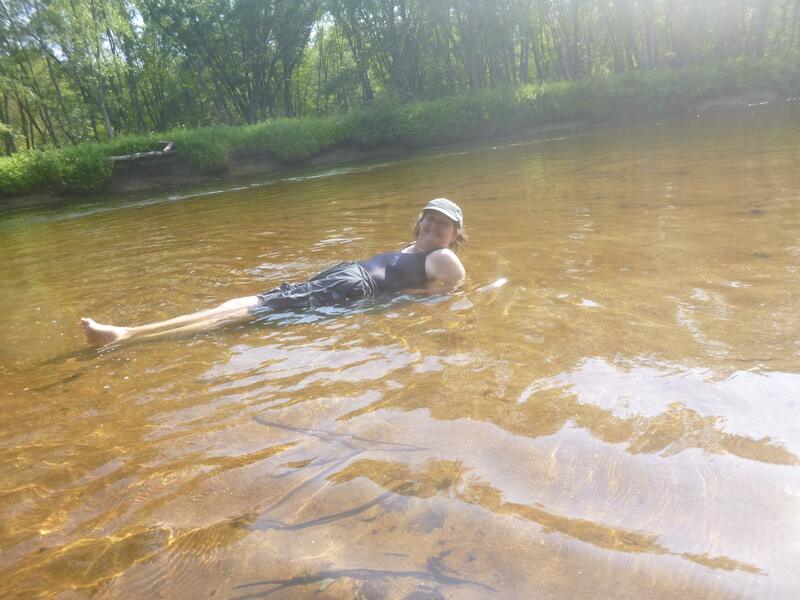 It’s been a couple years since I went with my gal pals*; this year Mila and I tried another section of the river. Tuesday was hot and sunny, but not too hot and not too sunny. Pretty much a perfect summer day, and – what luck! 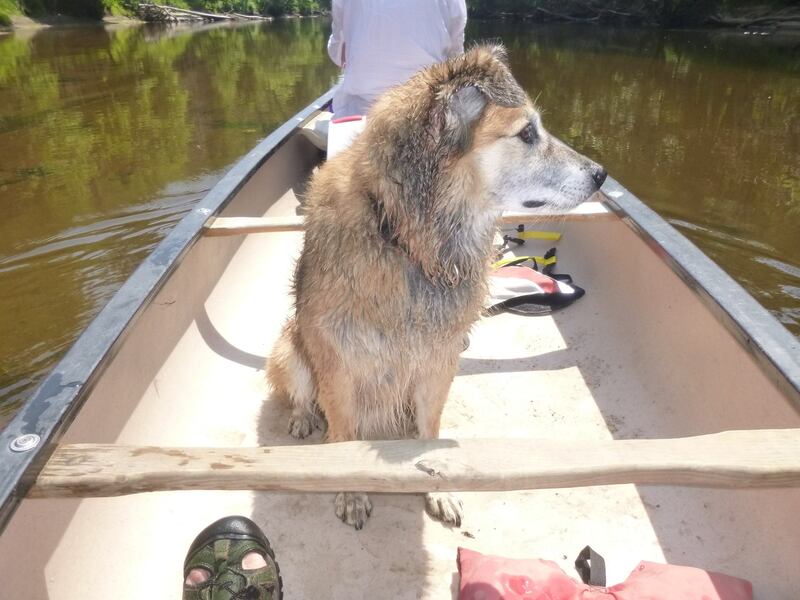 – the day we had selected for our canoe trip. As soon as the shuttle dropped us off, Chico was in the water for a wade. We loaded up and set off down the river. We left late enough in the day that it was quite warm at first, but by mid-afternoon the sun was a bit behind the trees and we could catch some shade. Chico’s calmly watching the river bank go by. The current carries one along fast enough that only the littlest bit of padding is needed to speed along – some steering in the stern is about all a canoe needs to make the distance in the allotted time. There’s plenty of time to stop on any of the many sandbars and take a dip or have a snack, or both. And we stopped about every half-hour or forty-five minutes to cool us all down and give us all a chance at something to drink. 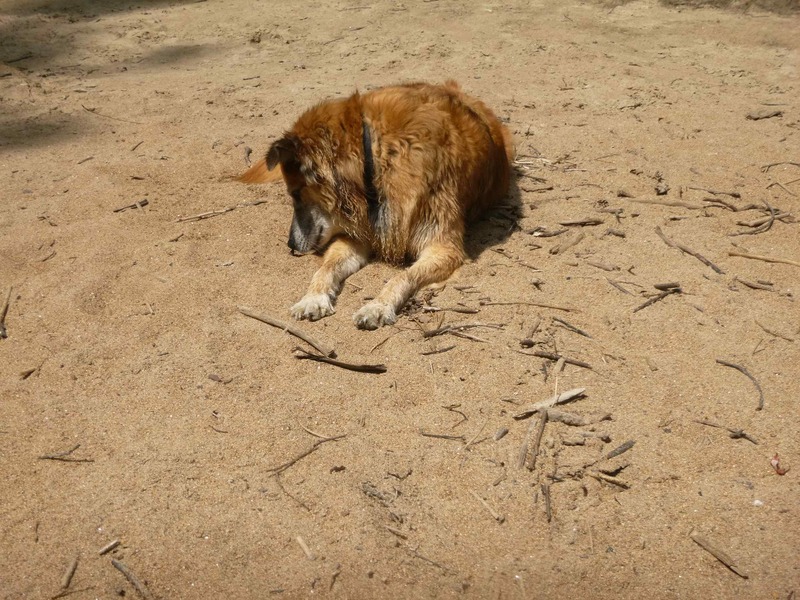 Chico seemed to enjoy getting wet and then lying in the sun to dry off. I believe we see him examining a bug. It was a lazy afternoon of exploration. Later in the day I figured out a great way to cool off without having to wade out or dunk one’s self into the deeper, colder water. Based on Chico’s appreciation of wading, I developed the half-in half-out lounge pose. just to make sure I knew what I was doing. arriving at the canoe rental place a few minutes before our check-in time of 5 PM**. Perfectly perfect timing. In fact, one could say it was a perfectly perfect day. Even for Chico: he got to go on a field trip, he got to swim, and he got to lick our hamburger plates after dinner. What’s not to like? * Re-reading that old post as part of my proof-reading this post, I realize that the first time Chico took a canoe trip on the Saco I noted people remarking on his good behavior, while this time, his good behavior is so well established that I didn’t mention the compliments from other boats or the fellow shuttle passenger who was surprised to have him pointed out to her a few minutes into the ride. Chico had just settled between the two front seats and was lying quietly, waiting for the next thing to happen. “Oh! He’s so quiet, I didn’t even notice him! What a good dog.” And I can now just say “Thank you!” instead of reciting his whole background and his development from the dog I got into the dog I have. 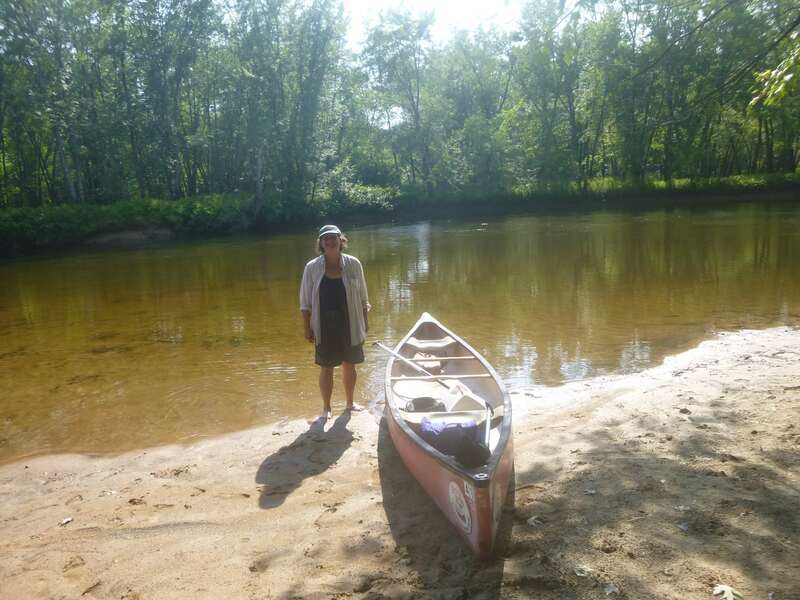 ** We rented from River Run Canoe Rentals in Brownfield, Maine. You park there, they take you up river and you paddle to where your car is parked. No meeting a shuttle at a certain time. And they are completely dog-friendly. Yay. 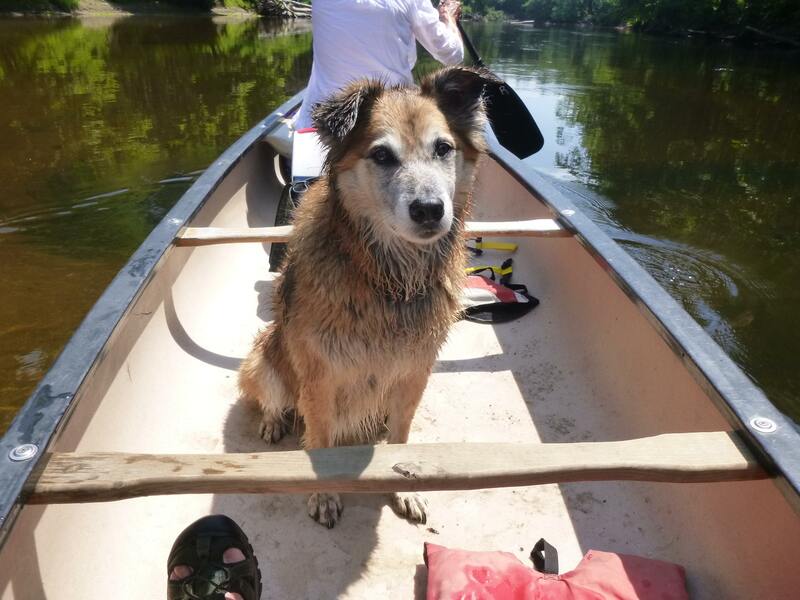 This entry was posted in Uncategorized and tagged dog friendly business, Field Trip, river run canoe rental, Saco River. Bookmark the permalink. Looks like a lot of fun. And how nice to have a friend along to take some pix of you and Chico together. The videos are fun, but I really like these pix! Thanks Kate. I love to hear what readers want to see more or less of.